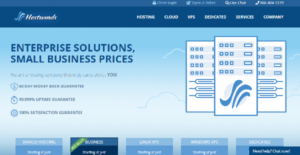 Founded in 2010, Hostwinds is a web hosting company formed with the purpose of providing businesses with a set of low-priced yet great hosting products in a very saturated market. Based in Seattle, WA (it is founded in Tulsa, OK), Hostwinds is a customer-centered hosting company that combines great and excellent features for prices that won’t break the bank. On top of their awesome hosting solutions, Hostwinds is also known for their top class customer support. Hostwinds guarantees a 99.999% uptime because it has a redundant A/B power, and a 60-days money guarantee in case you’re not satisfied with their services. Nevertheless, the company reports a satisfaction rate of 100%, which is the strongest proof of their excellent performance. They offer shared, reseller, Linux VPS, and dedicated hosting; but have also tailored a business-exclusive package with premium speed and reliability. The regular price of this package is $8.99 per month, but you will often come across special reductions and offers, and even be able to get it for as little as $2.69/month. The company is not only dedicated to speed and affordability, but also to supporting their customers’ success. A team of experts will be accessible 24/7 via phone, email, and live chat; prepared and willing to answer all of their questions. Hostwinds offers a 99.999% uptime guarantee (it has redundant A/B power) and strives to deliver such promise by constantly monitoring their servers and deploying state of the art generators for continuous flow of power supply. Hostwinds servers are housed in Seattle, WA and Dallas, TX, the latter inside the Dallas Infomart, the world’s first technology market center. The data center is temp-controlled by an extensive cooling system that includes four 500-ton Four 500-ton Trane Chillers and Liebert Air Handling Units, among others. In terms of facility security, Hostwinds parades 24/7 Armed Security, entry and exit points guarded by Check-In stations, video surveillance, and a perimeter fence with Gate Access control. How Much Does Hostwinds Cost? Hostwinds offers cPanel, a web-based control panel that gives users the tools to manage their domains via a web interface. With cPanel, users can have as much control and responsibility of managing their domains, including technical aspects like email information, backup, FTP, CGI scripts, and website analytics. Every business has its own characteristics, and might need a particular type of solution that will be designed for their company size, type of clients and staff and even specific industry they deal with. You should not count on finding an ideal service that will work for every company regardless of their history is. It may be a good idea to read a few Hostwinds reviews first and even then you should pay attention to what the hosting service is supposed to do for your company and your employees. Do you need an easy and intuitive hosting with just elementary features? Will you really make use of the advanced functionalities needed by pros and large enterprises? Are there any specific features that are especially useful for the industry you work in? If you ask yourself these questions it is going to be much easier to locate a solid service that will fit your budget. We realize that when you make a decision to buy Hosting Services it’s important not only to see how experts evaluate it in their reviews, but also to find out if the real people and companies that buy it are actually satisfied with the product. That’s why we’ve created our behavior-based Customer Satisfaction Algorithm™ that gathers customer reviews, comments and Hostwinds reviews across a wide range of social media sites. The data is then presented in an easy to digest form showing how many people had positive and negative experience with Hostwinds. With that information at hand you should be equipped to make an informed buying decision that you won’t regret. Hostwinds provides multiple customer support channels that include support tickets, phone, live chat, and email. The company also offers knowledgebase articles and FAQs for minor and easy to fix issues and concerns. What are Hostwinds pricing details? Hostwinds offer Cpanel web-based management interface. Yes. Hostwinds offers hosting services for both Windows and Linux. Hostwinds provides 100% WordPress support. Hostwinds offers unlimited bandwidth and email addresses for their Shared Web Hosting packages. Hostwinds provides SSL certificates for $75, which also includes installation. Magento is also included in Hostwinds’ eCommerce library. Furthermore, the provider also offers free SSL certificates with qualified hosting plans. Hostwinds guarantees 99.999% uptime for their clients because it has redundant A/B power. Even so, unexpected events occur and the provider is not responsible for lost income during those occurrences. Hostwinds accepts PayPal, credit cards, Skrill, cryptocurrency, and Alipay. Hostwinds provide basic security features for their plans but for an additional monthly fee, users get the Advanced Website Monitoring add-on. This particular feature gives websites around-the-clock monitoring and instantly notifies users with a help ticket in the event of downtime. For another monthly fee, users get the ID Protection add-on, which hides users' name and addresses in the Whois Registry. Hostwinds servers are housed in Dallas, Texas inside the Dallas Infomart, the world's first technology market center. The data center is cooled by an extensive cooling system that includes four 500-ton Four 500-ton Trane Chillers and Liebert Air Handling Units among others. In terms of facility security, Hostwinds parades 24/7 Armed Security, entry and exit points guarded by Check In stations, video surveillance, and a perimeter fence with Gate Access control. Hostwinds provides clients with Site Publisher and Weebly. Clients with 1 year of qualified hosting purchases receive a free domain. I have joined Hostwinds in February 2019. They have managed several websites that I have designed. My experience with the business can only be summarized as excellent! Can also mention that Hostwinds SSD host quickly provided me with references. The cost of hosting websites through them is also minimal compared to the benefit and service one receives. The support tickets where I have lodged a request were always timorously resolved and resolved satisfactorily. You made what initially seemed a daunting and intimidating process so easy. Hostwinds, thanks for spending so much time with me. It's rare that you get that kind of service anywhere, let alone on the web where it’s easy to be impersonal. You knew when to help and when to make me fix it myself. You're great! Pros: I have joined Hostwinds in February 2019. They have managed several websites that I have designed. My experience with the business can only be summarized as excellent! Can also mention that Hostwinds SSD host quickly provided me with references. The cost of hosting websites through them is also minimal compared to the benefit and service one receives. Cons: The support tickets where I have lodged a request were always timorously resolved and resolved satisfactorily. Pros: My experience using hostwinds SSD web hosting service has been nothing short of amazing. They answer my questions and the shopping cart and website designs are very easy for customers to use. I will recommend Hostwinds VPS hosting accounts based on SSD storage to all of my friends. Cons: Making my website has been fun instead of frustrating. Thanks! Pros: I love my new shop! So easy to use. No need to know html. I have received amazing customer service from Hostwinds! I am so happy that I chose this provider to host my domain - highly recommend! They still have very cheap pricing and I like it. Cons: They pass on great savings to me. Hostwinds is just a great company. Pros: Hostwinds is just a great company. They're reliable, work hard to make sure the websites are up and running, and they're quick to fix issues. Definitely a company I'd recommend (and have recommended). Cons: Their uptime can be higher, a little bit. Good support and responsiveness are really priceless. Pros: I have been with Hostwinds and want to share some thoughts of mine. I have rarely needed their support, but when I have, they have been extremely responsive (usually answer service requests or trouble reports in less than an hour) and you really feel how they put an effort into doing a good job. Good support and responsiveness are really priceless, so take this advice: never shop for low price when picking a web hosting provider. Cons: Their technicians can work a bit faster. Nice work, very professional! Thanks, Hostwinds! Pros: I write to inform you of my sincere appreciation of the wonderful and great help and support rendered by your staff Tom this afternoon to troubleshoot, diagnose and resolve my email problems with Microsoft Outlook and filter spams emails coming to my account with Hostwinds. Tom’s speedy troubleshooting, diagnosing of my Outlook email problems and resolving them without any loss of emails together with spam filtering of undesirable emails into my Hostwinds account are most sincerely appreciated with deep gratitude. Cons: Greatly appreciate Tom for his tremendous efforts, time and hard work in engaging me over team viewer to troubleshoot, diagnose and resolve problems and issues on Microsoft Outlook and spam emails. Thank you! Pros: Very helpful and flexible when setting up and managing websites. I couldn't get ruby on rails running with mysql so I compiled it myself with the extension, works fine. Their automatic upgrades of software are usually a little bit behind the release. I like their speed connection - it is pretty fast. Cons: SSD drives are really faster than HDD. It's cool! Pros: Affordable price, easy to use navigation, amazing features, efficient, green and non nonsense movements. Great provider! That's how a host should be. Cons: Their support must be a little bit faster. Pros: 100% reliability? No other hosting companies have the confidence to claim that since they don't want to be responsible for angry customers when they are down. I love getting paid when my site is down! Not that Hostwinds has ever let that happens...but it would sure soften the blow if it did happen!! Bottom line is I feel safe having Hostwinds host my site and I don't think I could trust any of those other scammers. Cons: Their uptime can be better but overall I like it. The service is worth the value perfectly! Pros: Having problem with my previous provider, last year I decided to transfer my hosting to Hostwinds. From then, it’s working fine. Their technical support is excellent! The service is worth the value perfectly! Cons: All works perfectly well for me. Hostwinds has one of the better user interfaces out there. Their Account Manager is surprisingly not that intimidating and pretty easy to use. Customer service answers pretty fast when I contact them. Don’t think my site has been down hardly ever during my time with them. Very happy with them. When I was looking for a Web host, I started by making a list of all those who advertised in a popular Internet magazine. Step two: I checked them out on the web. Hostwinds’s site was full of useful and easily accessible information on various aspects of maintaining your web site – a definite plus. Step Three… I phoned everyone on the list and asked how long they’d been in operation as well as for details of their services. One web host responded with an answering machine. (That one was crossed straight off the list.) Another promised to email information that never arrived. Hostwinds stood out in terms of friendliness, willingness to answer questions, and their offer of a trial subscription. I have been using Hostwinds for several months and have found their service and facilities to be extremely good. Having migrated several sites to Hostwinds I can fully recommend their hosting and extremely prompt support when needed. The customer support guy was very helpful and nice,helped me move my websites from another provider.On top of that i’m very pleased with the hosting service.Keep it up boys and thank you! Decent and reliable hosting providers. They have no hidden fees and are always up front, I have been completely satisfied since I started with Hostwinds. And prices are cost effective also. The team at them are very helpful and knowledgeable. I’ve had no issues with hostwinds uptime, and speed upload of my sites is pretty fast and I am on one of the cheaper plans that they offer. The uptime with them is great, no downtime, or outages at all. I am fully-satisfied. The most cost efficient VPS provider on this planet. There pricing was very affordable and well worth it. Very good contact with provider. Hostwinds support is very helpful and friendly. Their support walked me through the issue I was having until it was resolved; didn’t talk long as the replies were very knowledgeable. All works well for me. I am with hostwinds last 4 months, last month was merky with their software, they have fixed the issue and am still with their shared hosting and will be moving to their ssd vps soon. Value for money and their support staff is excellent, I stay 1000s of miles away, I dont feel it, cos their service is cool. Very pleased with the script support HostWinds offers. Other hosts haven’t been as diligent about making the latest versions available; I find this company very helpful and always up-to-date.. Thanks a lot! I’ve got a great experience with HostWinds. It was the first time I bought my own domain name and host services and I stick with it. Excellent services are provided. You are fabulous, buddies! And I am glad to be your customer. The support team at Hoastwinds is AMAZING!!! When they say available 24/7 they really do mean 24 hours a day seven days a week! When I had an issue they solved it in a heartbeat. Thank you Hostwinds support team! They are very responsive, prompt and know exactly what to do, very professional and has great tech knowledge! Bravo! I am very satisfied with the technical support which has been fast, and efficient. That’s why we will renew our services in the future with Hostwinds! They have a VERY nice support team. I was having troubles with my emails through outlook and they helped resolve it quickly. They’re packages could probably be a little cheaper, but they offer a bunch of tools and add-ons, which evens out the prices. HostWinds is a great hosting company! My Co-worker recommended me to choose Hostwinds ssd web host, so I decided to give them a try. I’m very impressed with their super fast servers. I’ve been with this host for almost a month. My site hasn’t been down any since I signed up with them. They have 24/7 chat, 24/7 toll free phone number, you can submit a ticket if you need help. I love the cpanel also. I highly recommend them. – Experience: Means staff is well trained and experienced, it matter a lot when you know that you have done it in past. – Cost: One would like to have lower cost but will not mean to compromise quality. – Good Servers: Hardware matters, old vintage slow and outdated severs may not be able to handle modern day websites. – Simple hosting tools and panels, easy to work and having options to retain flexibility. I think Hostwinds fits in all of these well. That’s way they are really good. Well, I can state that Hostwinds is a very professional yet friendly company providing excellent service. Their servers are reliable and fast and their hosting packages provide excellent value for money. As for customer service, I have found Hostwinds to be second to none. All questions are responded to promptly and their live help is always available. I have found that they will go out of their way to ensure all problems are dealt with quickly, above and beyond the normal call of duty sometimes. I cannot recommend Hostwinds enough to anyone seeking a fast and reliable service. My experience with HostWinds is awesome. Price range is less for hosting and customer support is good. I always refer my friends and customers. I like how they work for me. All is perfect with them. Since I came to Hostwinds for my hosting I’ve had nothing but fantastic service. Customer support has been great whenever I’ve had problems, and the live chat order assistant answered any questions I had about the service before I joined. The regular addons and upgrades to their customized control panel are always appreciated, and it’s a great alternative to cPanel. Overall in my opinion I’m glad to be a member of one of the fastest growing web hosting services on the net. They have been great, very reliable, helpful and all that. I love their connection, with so many free apps! They are so easy to install and offer many additional free features beyond what you already get. I can’t ask for more – Hostwinds.com is great web host. Whenever I have questions or need assistance with any issue, they are unbelievably quick to reply back with answers, and are willing to do whatever it takes to find solutions. Even over weekends and late night hours. I have had numerous occasions where I’ve had to work through some problems that had nothing directly to do with anything on their end, but they still took the time to work with me through every step of the process, including educating me with a lot of helpful information. Online support always available, very helpful, kind and above all quick! You often receive an answer a couple of minutes after you submitted your question. Can Say that Hostwinds is an amazing web host. The price and their products are great. I just want to say a big THANK YOU and I give Hostwinds CREDIT for the great customer service they provided. They convinced me with their extreme patience, great skill, and experience and I look forward to working with Hostwinds Hosting for the long term and will surely recommend their services. Amazing customer service! Helps with anything I ask. Great products. Host two websites with them. So easy to use from my mac! Wouldn’t go anywhere else! They are good enough to have a deal with. Thanks. No complaints about customer service, they help you a lot, believe me. All works like a clock with them. I appreciate your quality services. Thanks a lot for it. And I plan to be with them as long as possible. Their unlimited service is very cheap and the response time is very good and they offer 25% discount! I like the way they work for me and plan to stay with them as long as possible. They offer many guarantees such as 60 day moneyback, 99.999% uptime, 100% satisfaction and many more. Hostwinds is a reliable Web hosting service that’s simple to use and offers an array of useful plans for consumers and small businesses. They offer 25% off on all their services. Their live chat is responsive around the clock. I like them and I’m grateful to them for their unmatched services. I have been hosting with Hostwinds now for over 5 months, hosting 4 sites with them and not once have they disappointed. The set up process is fast and the information provided is clear. I’ve only received quick and friendly assistance on the few times i have needed to contact support. It’s usually been Michael I deal with and the experience has always been great. I always recommended Hostwinds when ever I am asked who i use for my hosting. Thanks for the great service! From the very beginning I’ve been impressed with the customer service and fast speeds at Hostwinds. You guys put up with all my newbie questions like “What username do I use to log into cPanel?”, “what’s my password?” or “how do i add a product to my site?” and you answer promptly each time and explain things that anyone can understand! I’m definitely recommending Hostwinds to anyone in search of a good, honest and loyal host. I cannot recommend Hostwinds ssd hosting highly enough. In my time with you I my site has had no downtime, responds faster than my previous hosting provider with a far superior hosting package for far less cost per month. Your customer service is second the none, rapid replies with amazing service with any query I have made. I know my web presence is in safe hands with you guys. Thank you! All it took was one mention to Hostwinds about the problem, and the tech support team went to work to find me a viable solution. I am happy to say my site is now completely protected from the misuse of others on the web, and I no longer have the added expense and headaches of dealing with it all. I just want to say “thank you” to the Hostwinds.com team for your tireless efforts in solving my bandwidth problems and bending over backwards to help the site run smoothly. I really appreciate it. I feel I must let you know that Hostwinds was excellent in helping me to troubleshoot my email problem over the weekend. When I wrote my request for assistance I was not expecting a response at 9pm on a Saturday but within half hour of my request Hostwinds responded and it helped me solve my issue. Great work indeed. This company is great in all aspects! They have great support with very fast response times, and good services. Their support is wonderful. Real people help in real time help kindly with issues big and small. Their support is really good. When you ask them to look at your problem, they are really quick. The communicate really good, because they keep you updated in every step. After reading all these positive testimonials, I fear I have little to add that would not sound redundant. So I’ll just add my name to what seems like a long list of satisfied customers. Great tech support, good price, what more can I add, hats off Hostwinds. The smooth transfer of my site can be fully credited to the hard working, professional staff at Hostwinds. The value can’t be beat. And every year they send me an email describing more that I’m getting – more features, more space, more databases, it’s always something, and it 8 months my price has never gone up. And the response is always but always competent, courteous, even kind, and I’ve never had to write back for clarification. Thank Hostwinds and all their tech people on your end for all your help. As always with these folks it’s a job well done. The service level with these guys has always been spectacular and feel free to forward this email to whomever in the host should be recognizing the level of commitment and service that they give….. I am 100% sure that this decent Litespeed server host would be a good place for running any website. I am using web hosting services for more than a month, their service is excellent and server is almost 100% up and running. I like them and how they work for me. This host is the best in the whole IT world. I chose Hostwinds because they use Litespeed server – as I know it is really fast. I put one site up with them to start just to try things out, I’ve since put up all my sites with these guys. I would recommend their ssd web hosting to anyone who is looking for a new host! The prices are good, customer support is awesome and it s quite reliable. Starting with my online business, all I was concerned was the cheapest possible deal and as far I could search the net, there was no comparison with costs vs features of Hostwinds. I recommend them for what I have got from them. Thanks! I have found hostwinds.com to be an excellent web provider for a number of months now. I host my web site and provide a reseller service for some of my web site’s members. When I do have questions or problems I can always reach tech support and get quick answers via chat. The web interface for billing and support is clean and simple to use. I’ve had excellent support, service and hosting. Thank you, Hostwinds! Would recommend to anyone looking for a decent priced hosting package. Only fear with HostWinds is that they’ll get too big and service levels will drop if everyone cottons on to what a great hosting provider they are. I am very, very impressed with the support I have received from HostWinds. The guys really know their stuff and always resolve any issues very quickly. For once dealing with support is a pleasure. Hostwinds Technical Support deserves particular recognition for his ability to resolve problems speedily and in a very considerate manner. They are exactly what you would hope for from technical support. I’ve been working with hostwinds ssd host for about 2 months now and I’ve had nothing but great experiences with their services. Thanks to them I was able to build multiple websites and learn more about it. I love Hostwinds because of consistent professional quality and easy accessibility for all my site needs. Every staff has been highly responsive to my questions and concerns with clear, concise answers to my questions, citations of rationale for their answers, patience, and politeness. Hostwinds, in my experience, provide an exemplary service. Beyond the bits and bytes the people that maintain it are very professional and really understand the needs of modern IT. Highly recommend their ssd web hosting services. I like this host, hostwinds.com is professional one. It never gave me the headache with downtime problems, and the support team has been very helpful and easy to communicate with. They are apologetic when there were problems and they give fast solutions. You get what an effective web host for a price that’s right. Hostwinds is cheap and provide good, reliable service without limitation on space or bandwidth. I love their scripts installer feature so I can test most popular Content Management Systems. I’m a big fan of Joomla and hostwinds is great for me. It is cheap and I get a lot of tools to play around with – some and I haven’t even used yet but still. A generous host that haven’t let me down in any way. They’re cheap, and HostWinds hosting features are just great for the price. Easy access to my data and mail, and the fastest, most reliable customer service in the industry. My customer support questions are answered within 1 hour. The answers I receive are clear and very helpful. I am happy and satisfied with the customer service of Hostwinds Hosting. Helpful, friendly manner, prompt reply. Services are resourceful and uptime is high. Their prices are not high. They are good for me. I have ever used and I highly recommend it to anyone without reservations. There are no hidden traps or fees. Service is excellent and they also have several ways to get customer support, which is also excellent. Hostwinds tech support always answers my questions within 5 minutes. And they have even given me PHP support mySQL support. I really enjoy my hosting experience dealing with this decent litespeed ssd web host. Can say that hostwinds is an excellent web host, easy to set up fast and through help and support service. Good range of price plans. They also offer the opportunity to install up to 340 CMS in one click. Good ssd web host. Speed is good, and the price isn’t bad at all. Especially considering I never have to worry about unplanned server upgrades & PHP changes affecting my clients’ websites. Amazingly quick support response. My previous hosting company used to take 12 hours to respond to anything, with HostWinds I got my first reply after 15 minutes and after a quick exchange to sort out the details the change I wanted was made 35 minutes after the initial request. Everything performs smoothly so far. I am satisfied with Hostwinds due to their stable shared hosting and user-friendly featured accounts. Customer support has been great in helping me since initial setup and till now whenever I need. They will walk you through the problem or they’ll take care of it for you. Some days ago our server was hacked. Hostwinds Hosting quickly stopped the hacked connection, blocked the IP address from the offending computer, reloaded affected documents with backups and reset our password. I am glad that they were able to act so quickly. So, when I contact tech support, the support team’s response is fast and courteous. When Hostwinds’ server is up and running speed is fine and everything is great. I am satisfied with their services. I am amazed that Hostwinds.com SSD Host can deliver this quality service at this price. Normally low price comes at the expense of quality or service. But not here. They respond quickly to technical queries and have been very very helpful. I can’t recommend them enough. I rarely need to interact with their support services because my websites are always functional and run well. The only couple of times I needed to ask them about some software tweaks because I had not enough knowledge and experience in all that hosting stuff. Support services have been absolutely superb with willingness, kindness and expertise. These folks go the EXTRA mile for you and I am absolutely happy using Hostwinds. My recent service call was handled very professionally, promptly and correctly. It’s a really good job and I recommend to use them. Their prices are affordable for me though my budget is not high. By the way they have solved lots of my issues which happened unexpectedly. We have not noticed any downtime or email issues and they are always sending message about new and upgraded features they add to the standard packages. I am very happy and proud that I run web sites with them. I highly recommend hostwinds ssd web hosting services to others. I was very surprised how stable their hosting is because recently my previos host provided uptime at level of 99.8% and they said it is normal. Now I see that host can provide real 100% like Hostwinds provides for me. Sure there are some occasions when they do server reboots, but they warn their clients about that. I cannot wish more and very satisfied. I’ve been using Hostwinds for a half-year, but it feels like eternity, because their service is so cool and technical staff provides everything needed to feel comfortable and safe with them. I am with ssd shared hosting and get 100% uptime in exception of server scheduled reboots and maintenance. Support is available all round the clock and reply in 20-30 minutes, they are kind and always follow up your issue until it is fully resolved. I can say that hostwinds.com provide professional hosting services. I changed the webhost because I needed MySQL 5.0 and honestly I wish I didn’t! This web host is for people who need a stable webhost with reliability and friendly support. Hostwinds is an extremely proficient host and usually manages to answer support tickets in 10 minutes or less. Everyone who visits my site is always impressed….so if you want to “set it and forget it” these are the dependable, trustworthy people you’re looking for. They also offer great tools, easy to use with intuitive video training available. Seriously, i’ve tried many web hosting providers and so far, this has been the BEST! Excellent service they provide. Guy on the phone was very knowledgeable and helpful. We had a problem earlier in the week and to insure that it would be fixed he stayed on the line with me and worked to insure things were corrected. When the email did not go through he alerted me and asked me to send it to a different location. Hostwinds is top-notch! Hosting service provided by them is reliable and fair. Servers are properly maintained and I have never experienced unexpected technical troubles. All software is working fine, no errors or slowdowns. Support team is there when you need and have rich experience in any hosting aspect. Highly recommend them if you need real quality of service. I’ve used (and abused) many hosting services over the years. Hostwinds have not only been extremely reliable, but also flexible. 8+ months is the time I have been with Hostwinds. They are reliable partner and deliver good service for me. At some extend someone might consider them as the company with not really fast support, but this does not demage overall great impression. Their support has always been excellent, very reactive when problems occurred (including when it was our fault, like a highjacked email account because of a terrible password) or when an operation was needed (installing certificate, etc). They helped us find adequate solutions to our needs, and discussion was very open. Migrating from shared hosting to managed dedicated server couldn’t have been easier. I haven’t experienced a more responsive, more responsible and customer oriented hosting company as Hostwinds. I am totally satisfied by their tech support, price and the complaint free reputation. They have fast servers and connectivity which makes my websites lightning-fast loading. It is very important for me that my website should always be fast and accessible, so I am going to stay with Hostwinds until they provide similar level of quality service. I am very happy with the excellent support received from Hostwinds for cleaning my website database system, php, joomla which were attacked by malicious files. I am so relieved and I can only say that you very much!!! I use Hostwinds for both of my websites, and have always had nothing but good things about them. Quality service for a very affordable price, and not to mention there customer service is top notch. I have had questions throughout the past about issues, and some not even concerning there product and they are still willing to help and provide any information that they can! I would recommend this service to everyone in need of a hosting company! With Hostwinds everything is working smooth and with no headaches. I am using their ssd shared hosting and even with lowest plan I get full service like 24/7 client support and guaranteed uptime. Definitely recommend them to everyone! Hostwinds ssd hosting service is cheap with lots of great features! I love the plans and how your space and bandwidth increases each month. Hostwinds.com keep improving their plans. and unlike many other hosts.. these improvements are applied to new AND existing customers. You can’t beat the price, the support is wonderful and quick, they love giving their users (new AND old) all sorts of goodies. I love the referral program. I have been extremely happy using their hosting services. Recommend this host! They have a very professional support team, they helped me install scripts with no hassle. Their features are exactly what is needed and is easy to use. My hosting speed is quite fast and traffic is good and I recommend to use them for those who are interested in getting quality services. Unbelievable, Hostwinds Uptime is (nearly) 100%. You know, I’ve encountered a few small hick-ups in the last 9 months but in fact I haven’t encountered any problems during the last 5 months. You’ll get all the help you need from the very beginning of your relationship with these people, and at a remarkably competitive price. If you need more information about Hostwinds or you simply have a question let us know what you need and we’ll forward your request directly to the vendor.